The chicken feet at Floata Seafood restaurant in Vancouver. The last time I was here, maybe ten years ago, Wong and I had a memorable Sunday brunch at a cavernous restaurant smack in the middle of Chinatown, called Floata Seafood, and it’s here that I’ve suggested we dine again. But Wong isn’t crazy about the idea. “Always very crowded on Sundays,” he says. He suggests we try a place on Fraser Street that has excellent Cantonese- and Northern-style dim sum like har gow (shrimp dumplings) and lo mai gai (sticky rice wrapped in lotus leaves). Sounds good. But I’ve been thinking of the dim sum at Floata for days now. Besides, it’s just a couple of blocks from the Dr. Sun Yat Classical Chinese Garden where I want to visit this afternoon. Stephen says, Okay, we’ll go to Floata, but I can tell he’s not happy about it. When we get there, I can see why. The place is a zoo. (Floata’s happy claim to fame is that, seating over 1,000 people, they’re the largest Chinese restaurant in Canada.) At first we’re told there’s a 30 minute wait but after Stephen has a private conversation with one of the managers, we are suddenly escorted to a table in the back of what looks like a convention hall. Much of the room is filled with large round banquet tables, the type that seat eight to twelve people. Lots of families. Lots of maj jong grannies. It’s like a large wedding reception with kids running around and people sitting up on an elevated dais in the front of the room and loud music, laughter, pandemonium. And then there’s me, a gwai-lo, and Stephen, sitting in the back. So here’s what happens when you get seated at Floata: the receptionist puts a number on your table (we were 49), and then a young woman promptly brings you tea (without asking), and then you wait for the little old ladies wheeling trolley carts to come by your table with the dim sum. Except if you’re a party of two and you’re sitting in the back of the room, you’re lucky if the carts ever make it back that way. And if they do, they’re often times low on food (there’s a trick here to ordering; you have to check the carts to see how many servings of, say, BBQ pork bun, they have left because if it’s only one or two, it’s usually old and that silky quality of really good dim sum has been replaced with kind of a nasty paste flavor). Now, Stephen Wong knows just about everybody in Chinatown (if not Vancouver) and, as I said, he’s an accomplished restaurateur and cookbook author, so at most restaurants around here, we’d be well taken care of. Which is probably why he suggested we go to some little place in his neighborhood (but I wouldn’t listen). But here at Floata, in a dining room that looks like a football field, where maybe a thousand people are waiting to be fed by dozens of servers spinning their trolleys through narrow lanes—well, it’s just not happening. Still, we eventually get some siu mai, which is very salty, and pork congee, which is very salty, and chiu chow, which is…well, you get the idea. 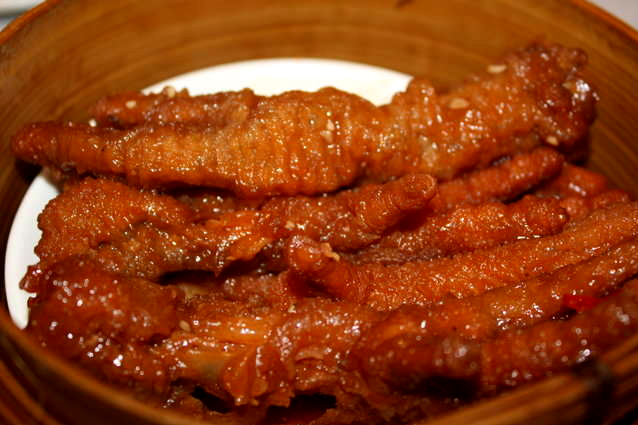 The best dish: chicken feet. Salty, but tasty. Walking to the Dr. Sun Yat garden after lunch, I apologize. “You were right,” I tell Stephen. “Sometimes a famous old restaurant is just a famous old restaurant,” he says. Smiles with a icky face.